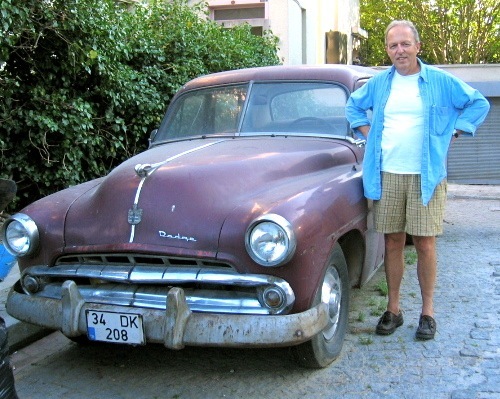 There are scads of surviving Mustangs choking our roads and filling Social Security Administration parking lots to this very day but Mavericks are few and far between. Introduced as the successor to the Falcon, these fast back-ish tudor sedans were Ford’s riposte to Plymouth’s Duster and Chevy’s Vega. 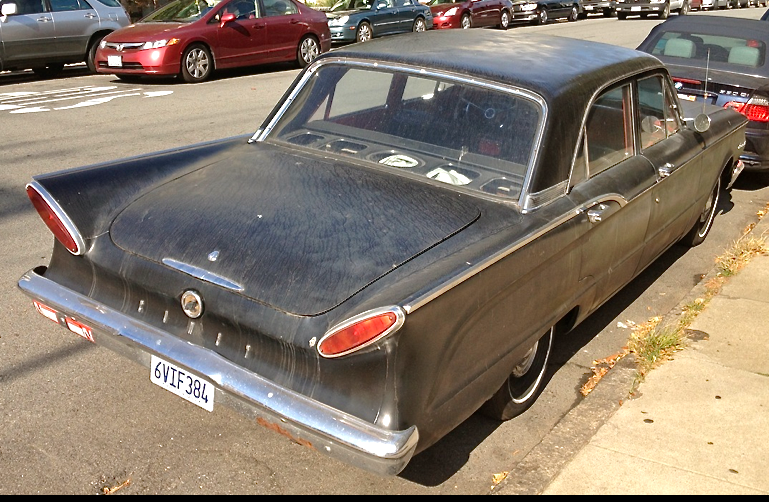 Underneath that sleek, swoopy exterior were the guts of the predecessor Falcon on which, of course, Mustang was also based. On the same platform, Ford built equine and bovine, not to mention peregine-themed products. Quite a feat of bio-engineering! 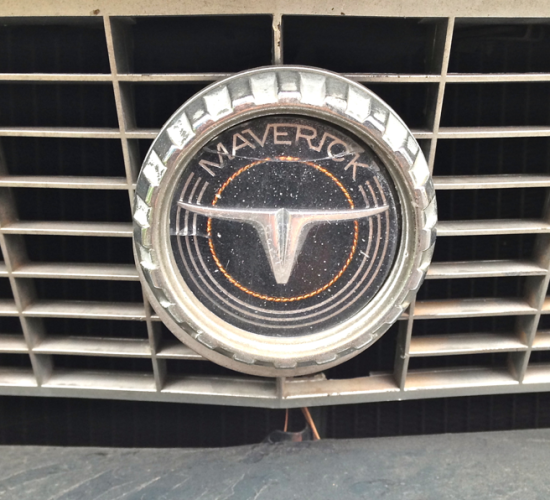 Maverick showed up in 1969 and the Falcon nameplate was dispatched to the recycling bin of automotive history though it continues, uninterrupted, to this day in Australia for some reason. 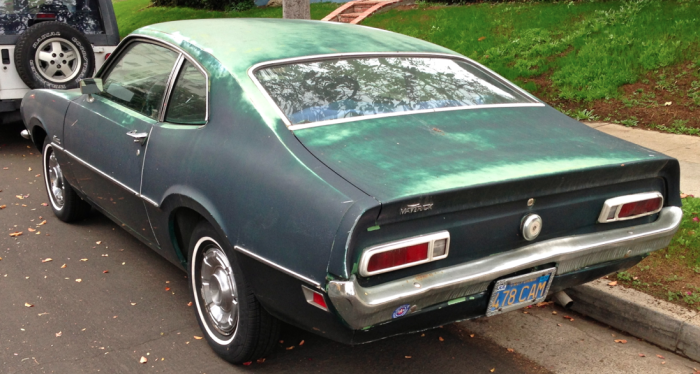 We just love the patina on this ’71 Maverick, finished in multiple hues of moss-over-lichen and the fact that, after 43 years, it appears to be totally unmolested. 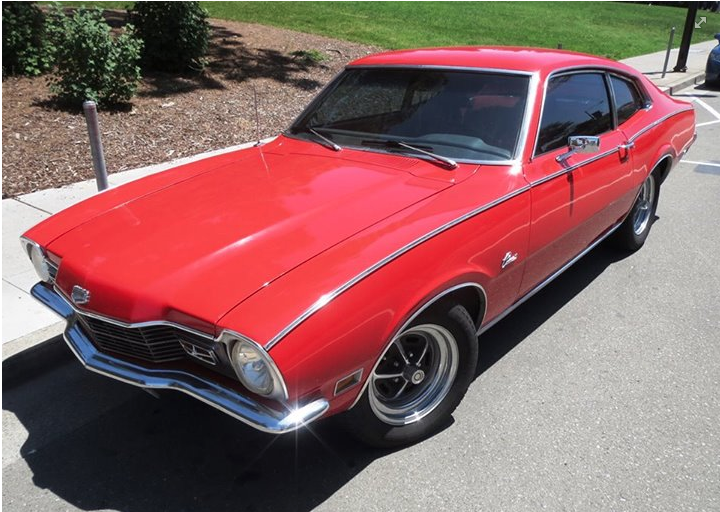 Maverick continued for 7 years and sold vast numbers though they’re not often seen these days. 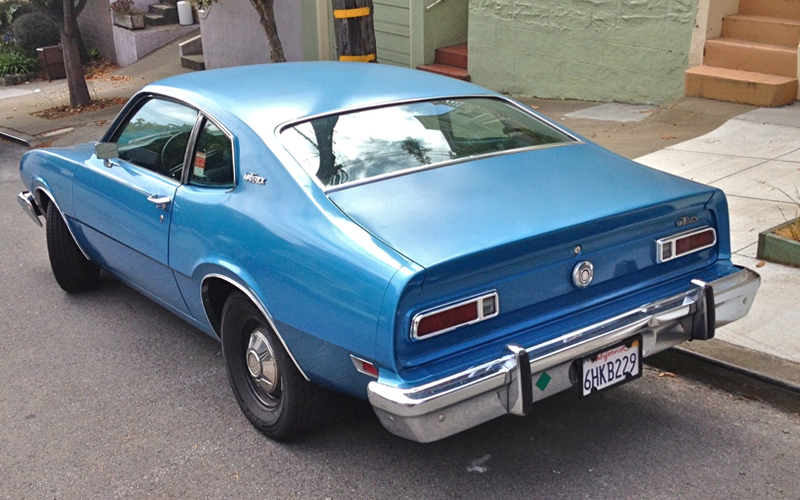 Bigger bumpers were mandated by mid-decade as evidenced by the massive energy absorbing appurtenances on this ’74 in a chalky shade of blue. Photos by Feral Cars Scout Andrew Keeler. It must be noted that Falcon’s Mercury-branded sister-under-the-skin Comet continued as a badge-engineered version of the Maverick that was fitted with a bit of a protruding proboscis and some additional chrome accents. Feral Cars Scout Steve Sultan captured this one just a few days ago, classing up a Berkeley street. 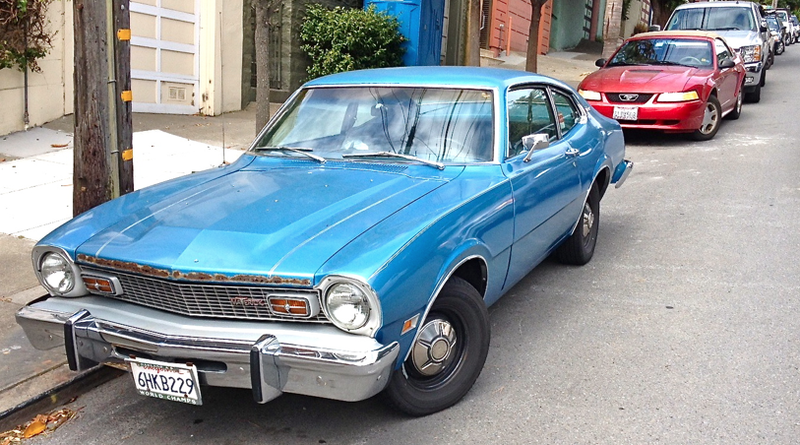 We certainly don’t intend to give short shrift to the Maverick and Maverick-based Comet’s predecessors so here you go with a set of original Ford-built compact cars. 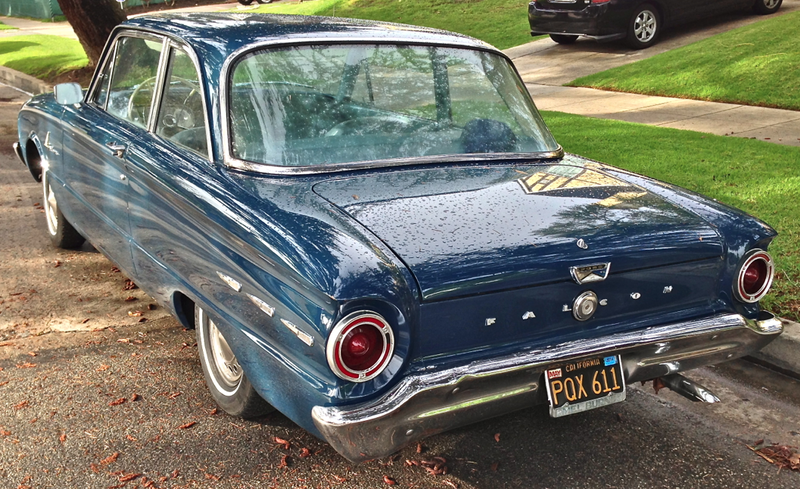 Feast your eyes on this 1961 Comet in black and a classy teal blue 1961 Falcon. Roots, mon! Check out this compilation of Maverick and Comet commercials. The cougar kitten is a warm and fuzzy touch, no? The purchase price of $1,995 cited here equates to $12,200 today. Still a deal! Speaking of deals, check out this must-have Mav: a 48,000 mile cream puff in black for under $5K! 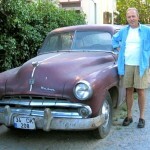 This entry was posted in Chevrolet, Comet, Duster, Falcon, Ford, Maverick, Mercury, Mustang, Plymouth, Uncategorized, Vega on 06/04/2014 by feralcars.